A classic partnership game that resembles a Chinese fusion of Big 2, Spades, and to a limited extent, Bridge and Poker. It is supposedly derived from a Chinese climbing game called Zhēng Shàngyóu (争上游) which literally means "Struggling Upstream". This review is dedicated to Jack and Roy, who both seemed to enjoy the game. "We thank Mr. Chuang, tour guide for the German speaking department in Nanjing, for everything. He is highly recommended as a guide, for he knows everything: length of bridges, the meaning of Buddha, the number of trucks in the province. On request, he also knows the meaning of bridges, number of Buddhas, and length of the trucks. He can tell you about the statue with 5 goats and a hill and 38 warriors that is the symbol for the city. Perhaps, the statue has 3 goats and 58 warriors, but, in any case, there are more warriors than goats. And truthfully said: the statue could also be the symbol for Guanschou or Wuhan. But, in Nanjing there are over 1000 Buddha temples; definitely, this area has its symbols. Yes, Mr. Chuang is a wonderful tour guide. He throws his Nanjing in the Yangtse and takes us into an unknown world of rock concerts, psychiatric clinics, and private meetings with magicians. But with the game he does not speak so easily. Of course, he knows it. He knows everything. But, about this game, that the people play in all the parks and all the meeting places, he will say nothing. It is not politically correct. He leads us away from the groups playing this game, saying this game cannot be explained. *If we had believed that, there would be no rules for the game. We finally brought Mr. Chuang around. In a back room of a souvenir shop near a Confucius Temple, he gathered players for a game of Tichu. First, we were only allowed to watch. Then, we played, and the Chinese experts gave us good advice on playing the game. - This was a great introduction to the game. We strongly recommend this method of learning the game." "This box/package doesn't contain a refrigerator"
From my understanding, whilst there is a tinge of familiarity about Tichu with the Chinese people, I am told that it is still significantly different to the traditional card games that they know. Publisher: My version is from AbacusSpiele and Fata Morgana as theirs is a special metal tin box edition. Other publishers include Rio Grande games or Playhouse. Players: Usuallly 2 OR 4, but there is a variant called Tientsin that plays 6 players. According to Wikipedia and the rules, there is yet another variant for 5-12 players called Grand Seigneur. A three player variant is possible called Threechu. However, Tichu purists apparently insist that it is a game that should only be played by 4. Price Range (AUD): $17 to $30. Anything above $20 is overpriced. I bought my metal tin edition for about $18 - even that was pushing it. After all it's just a deck of cards!!! It would be nice to see a simple version on the market for $10 or less. Availability: Quite widely available online. I haven't seen it in hobby shops. You can use a standard deck of playing cards if you can find distinguishable jokers to use for the 4 special cards. After all, Tichu's components just involve a standard 52-deck of cards + 4 special cards (see below). This game combines the best aspects of Big 2 with the team elements of Bridge and Spades. It therefore makes for quite a fun and engaging partnership game that is nowhere near as hard or complicated as Contract Bridge. To understand the game you should take a look at the rules below. Apart from that, I would say that this game is deep enough for there to be lingered interest but not too simple for people to question its replayability. Some amount of teamwork and strategy is necessary. 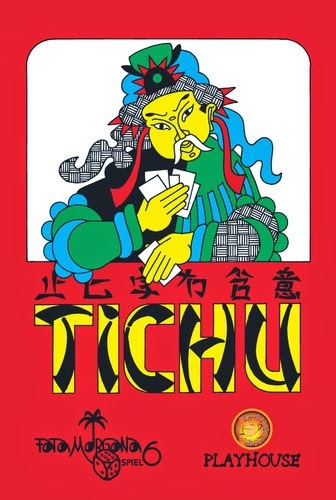 In particular, "covering" your partner when they call Small Tichu or Grand Tichu (or, if you are the opponents, destroying the caller's chances of obtaining Tichu) is one of the highlights of the game. Scoring is a "first to 1000 points" scenario. Some enjoy this because it gives an opportunity for one team to catch up plus it ensures that the most "consistent" team wins (if there ever is such a thing in a game of cards where luck is a dominant, but of course, not a decisive factor). On the other hand, people may find this tedious as it involves pen and paper. If you don't like contract bridge, you may still like this game; although, I do think that if you enjoy trick-taking games like Hearts, Spades, 500 or Bridge, chances are you will like this game a lot. Interestingly, this game draws a distinction between finishing first (which awards points if you or your partner calls Small Tichu or Grand Tichu) on the one hand, and scoring points from tricks (which awards points based on how many 5's, 10's or King's you collect). It is sometimes the case where these two goals are at odds with each other. 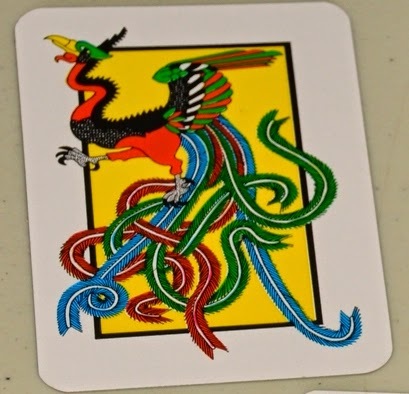 This makes the use of the Dragon and Phoenix particularly fascinating as those cards give players the ability to finish quickly but at the cost of awarding your opponents with more points (in the case of the Dragon) or awarding yourself with the Phoenix (which gives you negative points). See the rules for a better understanding of this. *19/7/14: Revised from 8.0. After many replays I've realised how great this game is. This is a gem of a game that turns an already-accessible classic into something quite extraordinary. The bidding mechanic, scoring system and special cards really add a great partnership flavour to Big 2. There is much luck of course, but the excitement + tension is quite palpable, making for a great card game. This game is truly ingeniously thought of - the new rules and cards superimposed on top of Big 2 are simple enough for them to be understood, yet complex enough to add layers of strategic depth and excitement to the game. Of course, luck still plays a huge part though. Some aspects of the game may be hard to explain at first, especially when it comes to scoring with the special cards and when talking about the bonus of 200 points if two partners are able to finish before any of their opponents finish. But this added depth to the rules gives this game a wholesome flavour and feel - it's not too complicated. If you were never a fan of trick-taking games, you probably wouldn't enjoy this game. If you like Big 2 and/or Spades/Bridge, and don't mind (or enjoy) "team" or "partnership" games, then you should really give this a go. Here are what the suits look like. We have Black Swords, Red Stars, Blue Pagodas and Green Jade. Partners sit opposite to each other. There are 52 + 4 special cards in total. Of the 52 cards, there are 4 suits (Jade, Sword, Pagoda, Star) each from 2 to Ace (13 x 4). Grand Tichu: At the start each player draws 8 cards then STOPS and thinks about whether they want to call Grand Tichu. This is a bet or wager of sorts that they (and only them - not their partner) will be the FIRST person to put down all their cards. If you win the bet, you get 200 points. Lose the bet and you lose 200 points. 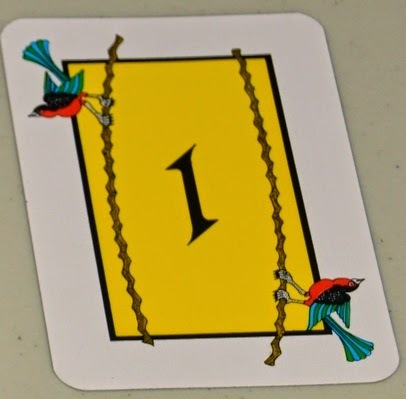 Now, at any time before playing their first card (hence even after others have played and even after cards have been passed as explained below), a player may call "Small Tichu". This works in exactly the same way as Grand Tichu except the value at stake is 100 points as you have a better chance of doing it, having seen all your cards (Win the bet = 100 points. Lost the bet = - 100 points). Hence just because 1 person bids Tichu of any sort doesn't mean no one else can. Now each player passes 1 card to every other player. Hence 3 cards in total are passed. 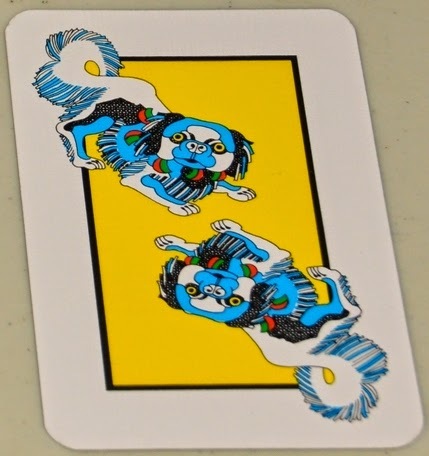 Usually you would pass a favourable card to your partner (especially if they have just called Small Tichu or Grand Tichu) and 1 lousy card each to your opponents. Whoever owns the Mah Jong (Big 1) leads. Making a Wish: The leader can, if they want, make a wish at the start (but only at the start). The wish can be a numerical value from 2 to Ace. Whoever has the card wished for must play it IF THEY CAN in a given combination led, even if it ruins their gameplan (see below on combinations and"Special Cards"). Whatever combination is played, the player to the right of the person who just played that combination MUST FOLLOW THAT COMBINATION. So if a triple is played by the leader, everyone must play triples. Whoever plays a combination that can't be ousted (meaning all 3 players pass) wins that "trick" - which is all the cards that have been played. That person now has the right to lead whatever they like. Mah Jong - the leader and the wishmaker. You can pass the Mah Jong too if you want. Mah Jong: As stated above it determines who goes first, and the card itself can be used as part of a straight or played as a single. It need not be played first - it can be saved for later. Also grants the owner of the Mah Jong a wish. The wish is stated when the Mah Jong card is played (which, as I mentioned above, need not necessarily be played straight away). They may, if they want to, name a value from 2 to Ace and someone else, must fulfil the wish if they can play the combination led. The wish remains until it is fulfilled. This rule is a bit trust-based because it relies on everyone complying with the rule. There doesn't appear to be a penalty for getting it wrong. For example, if the leader calls 9 as their wish and plays 555 (triple 5), and the next person playing has only 1 '9', they don't need to play their 9 as they can't play triple 9. The Phoenix as a standalone card (ie, if played as a single) cannot fulfil a wish [see below]. Dragon - win the trick and give your opponents 25 points! Very confusing at first but fun and interesting when you think about it. 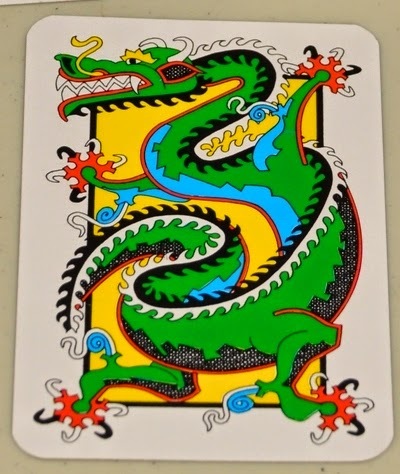 Dragon: This is the HIGHEST single card. It can only be played as a single and is never part of any other combo. It ALWAYS beats any other single, even the Phoenix. The Dragon by itself is worth +25 points! TWIST/CRAZY RULE: If you win the trick with the Dragon, as a sacrifice for having such a powerful card (it helps you win earlier and get rid of all your cards, which can be critical when calling Small or Grand Tichu), the trick you won gets given to the opponent of your choice. However you still retain the lead. Phoenix - win the trick and get -25 points, like the Dragon, what a double-edged sword. Can also be used as a wildcard in any combination. If the MahJong leader wishes for a number, the Phoenix has to be played if it would allow another card to be played. Eg. if a 3 is wished for and you have 3456 and the Phoenix, you'd have to play 3456Ph. However, the Phoenix can never be used to fulfil a wish as a single card. So if a 3 is wished for and you have no 3's, you do not need to play the Phoenix if you have it. TWIST/CRAZY RULE: If you win the trick and the Phoenix is in it, it's worth -25 points. My favourite card out of all - give your partner a helping hand and a free lead. Blue Dog: This is probably the coolest card in the game. If you are already in the lead and play the Blue Dog, it gives your partner the lead for free. Hence it basically skips your opponent's turns. Everyone looks at the tricks they won. 5's are worth 5 points per 5. Hence, under basic scoring, There are (5x4) + (20 x 4) + 25 - 25 = 100 points up for grabs between the two teams. Finishing first when you called Small Tichu or Grand Tichu results in an additional +100 or +200 points respectively. Failing to meet Small Tichu or Grand Tichu results in a loss of 100 or 200 points respectively. But there is a special rule that overrides everything else. SPECIAL RULE: If two partners put down all of their cards first BEFORE their opponents finish, they automatically get +200 points and no additional scoring* is counted. So if Roy and Nimalan are on the same team and Roy finishes first, followed by Nimalan, meaning that they finish before Jack and Hari (who are on the other team), Roy and Nimo get 200 points. That is the end of scoring. Points from tricks and calling tichu, whether or not they benefit any team, are not counted [This is my reading of the Abacusspiele and Fata Morgana rules*]. In other words, the team that didn't finish first gets 0 points. *However, I am informed that many groups prefer to play a more punishing version of the game, whereby if the two partners of one team finish first and second respectively, the scoring for Tichu still applies. Feel free to play this if you want, although I am not sure the express words of the rules specify this to be the case. Of course, it may well be the case that the designers of the game did not intend my interpretation of the rules above. The first team to reach 1000 points wins. If more than 1 team reaches 1000 points, whoever exceeds 1000 more wins. You've got two rules wrong here. 1. The wish is made when the Mah Jong is played. Often, but not necessarily, the beginning of the hand, but only when the player with the Mah Jong is actually playing it, as a single card or in a run. This allows for deeper strategy. 2. When partners go out first and second, points awarded or deducted for completed or failed Tichu calls are still counted. If, to use your example, Jack and Roy have both said Tichu, Roy goes out first, his partner Nimo goes out second, the hand is over, and the score for the hand is 300 to -100. Also, this wasn't explained incorrectly, but you didn't mention that if a player bombs the dragon, the trick containing the dragon is not given away; the player who won with the bomb keeps all the cards. 1. I partly agree that I did not make this clear enough with my reference to the "leader". I should have referred to when the wish is granted, which is when the actual Mah Jong card is played. I will mend this accordingly in due course. 2. I disagree with this. Counting must be the scoring, as this section appears right after the scoring. This too appears after the scoring section. I would imagine that declaring Tichu is part of the scoring/counting. If you found anything that says to the contrary in the rules, please let me know. However, it is entirely possible you are reading this from another set of rules. In my view, the rules I have stated make sense because it discourages the creation of a ridiculous gap between the teams (too big of a gap would arguably ruin the fun of the game as it gives one team the runaway lead). Then again, if you prefer to play with such a punishing rule, please by all means do. 3) Yes, as for your last point, I tend not to explain every single rule these days as it takes too long. I just want to give readers the gist or feel of the game. Yes, the counting of points in the cards is skipped. It's intentional that this part is explained in the rulebook before it explains Tichu calls, as the Tichu calls are not made invalid by the double win, just the points within the cards. Every online version of the game includes points for Tichu with a double win, BSW as wel as the apps for iPhone and Android. I have also played it with gaming groups in California, Seattle, and here in Ohio, where I learned it, and that's how everyone I've met who plays it counts it. Also, a quick search of the Board Game Geek forums has this clarified in several places. I don't think it's punishing. I've been behind by about -50 to 750 and gone on to win, so large point differences certainly don't make the game broken or less fun. Also, it's pretty rare for a player to make his Tichu and for his partner to go out second, as there's a good chance his partner has the dog and has passed away his best card. Grand Tichu is most often called by a team that is far behind, so the option of scoring 400 points in a single hand helps teams that are losing more. Anyway, it's definitely the rule, but you also totally don't have to do that. You might try it that way and see, though it doesn't happen even necessarily in every game, so it might not affect game play at all. If you prefer not to play with that rule, I fully support house rules (we have one friend who prefers a variant called "Chaos Tichu"), but just thought you'd like a heads up, if you go to play online or on an app, or with strangers, you're likely to encounter the rule difference. Either way, I'm just glad it seems like more people are playing this game. I play a TON of games, and this is still my favorite. I appreciate where you are coming from and what you say about how other people play it. Fair enough by me. I note your point that the section on Tichu scoring comes after that "no further scoring" rule. However, despite this, from my perspective, it would seem to me to be a step too far to construe that "scoring" does not include Tichu scoring - the phrase "scoring" by itself surely is open and general and in my view should encapsulate all forms of scoring including Tichu scoring. If what you say is true, I think game companies/publishers should take care to clarify all their rules in the game manual itself. The ordinary non-enthusiast consumer who picks this game up at the shops is probably not going to be looking at boardgamegeek forums to clarify the rules - all they look at is the rules themselves as published, and it is entirely reasonable that they might conclude what I have concluded as well. I think we have spent too much time on this already. Hopefully it is clearer to you now why I have endeavoured to explain why I take issue with you saying that "it's definitely the rule" when the plain express words of the rulebook itself (and nothing else) seem to suggest otherwise.